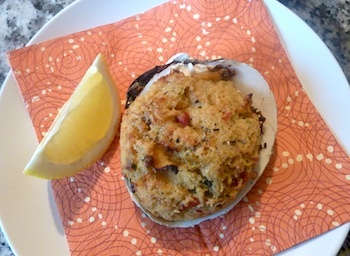 Easy Stuffed Clams Recipe | "Stuffies"
Make this easy stuffed clam recipe tonight! Stuffed clams are a favorite up and down the New England coastline and especially around Narragansett Bay in Rhode Island and Southern Massachusetts, where most clam shacks offer "stuffies" to eat on the spot or to take home to enjoy later. New Englanders use large quahogs (hard-shell clams) to make stuffies. The clams are taken out of their shells, chopped up, mixed with other ingredients including breadcrumbs, mounded back into the shells, and baked. Everyone has their own version of this recipe - some add bacon, others a bit of ground chourico, linguiça, or other sausage, still others use fresh breadcrumbs instead of dried. You'll find stuffies with bits of celery, chopped green peppers, or kernals of corn cut from the cob. Purists use more clams and less breadcrumbs than we do. Fresh herbs such as sage or oregano add a nice taste. Try our recipe, and then add your own special touch. Stuffed clams make a great party food, and are great for cookouts and backyard barbeques. With a cup of chowder and a crisp green salad, they make a perfect lunch or dinner. Although we use fresh clams in our stuffed clam recipe, you can also use a 6.5 ounce can of minced clams. Drain them, keeping the juice. Bake them in shells if you happen to have some, or in oiled muffin tins. For a party, make a big batch a day ahead of time and refrigerate. They also keep well in the freezer for about a month. Fill a deep, wide skillet with about 1/2 inch of water, and bring to a boil over medium heat. Add the quahogs in one layer and cover. Steam the clams for about 4-5 minutes. As soon as the shells open, remove the clams from the skillet, and discard any that don't open. Remove the clam meat, but not the "foot," the part that attaches to the shell. Chop the meat into small pieces. Break apart the clam shells, remove and discard the clam foot, and rinse the shells. Set aside 8-10 of them. Retain the cooking liquid, and rinse out the skillet. Add the olive oil, butter, and onions to the skillet and cook over medium heat for 2 minutes until the onion softens. Add the garlic, saute for another minute, and remove the skillet from the heat. Add 2 cups of the breadcrumbs, thyme, parsley, red pepper, lemon juice, 1/4 cup liquid from steaming the clams, salt, and tabasco. Stir to completely moisten the breadcrumbs. The mixture should be moist enough to stick together, but not too wet. If needed, add more clam liquid or more breadcrumbs. Lay the clam shells on a baking pan. Spoon or scoop the stuffing mixture into each shell - we use a small ice cream scoop. Depending on how much you put into each shell, you'll probably fill about 8 or 10 shells. 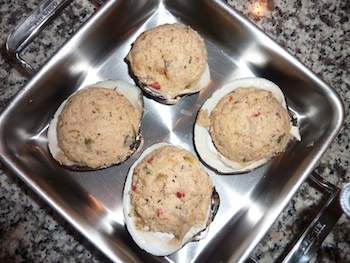 Bake for about 20 - 25 minutes, until the stuffed clams heat through and turn a light golden brown. Serve with a slice of lemon, and tabasco or hot sauce on the side.